GAF has also embraced the sustainability movement with an extensive variety of environmentally friendly products for both residential and commercial properties. GAF is proud to utilize recycled materials and recovered roofing materials to minimize landfill waste. GAF has also incorporated solar roofing products and “cool” reflective roofing into its product line, along with sustainable manufacturing processes and a Zero to Landfill target benchmark for each job site. GAF has also developed the innovative Advanced Protection Shingle Technology, which minimizes the use of scarce natural resources without compromising on durability and wind resistance. GAF was also first manufacturer to have all of its shingles pass the industry’s two toughest wind resistance tests: ASTM D3161 Class F 110 mph and ASTM 7158 Class H 150 mph (per UL public listing). 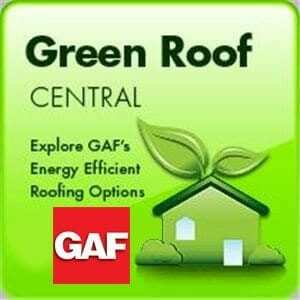 GAF’s Certified Green Dealer Program is the only program of its kind in the country for training and certifying building materials dealerships in using green building products and practices. Our Certified Green Roofer program recognizes contractors who effectively incorporate recycling .Through the Certified Green Roofer Program, GAF has trained more than 250 professional roofing contractors nationwide in shingle recycling. GAF has also been a longtime sponsor of ShingleRecycling.org, which helps contractors and distributors connect with qualified shingle recyclers across the U.S. and Canada.